THIS WEEKEND IN BASS - mudd up! this Saturday in Manhattan, the Soot gang’s all here. (a real accomplishment considering we’re nonstop touring and live on 3 different continents). 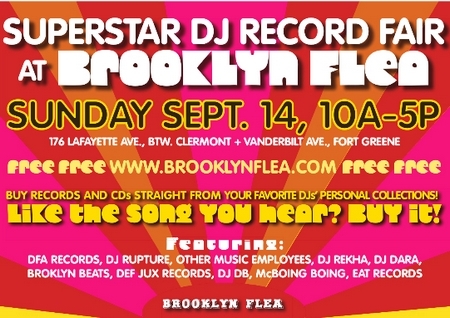 then on Sunday I’ll be setting up shop alongside other “Superstar DJs” at the Brooklyn Flea and selling some choice records from my collection. $5 b4 11pm, $8 after. 10pm-late. 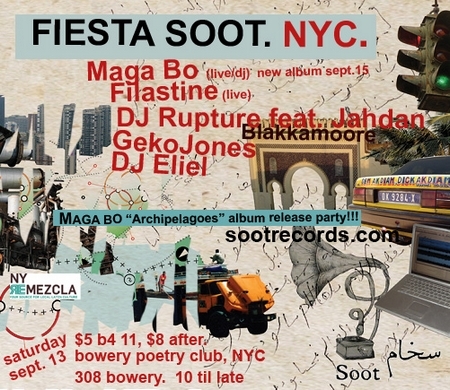 “to celebrate the release of Maga Bo’s debut album, Archipelagoes (in stores on September 22nd), we’re uniting the world-travelling Soot gang to a Manhattan rendezvous on Saturday September 13!! Maga Bo from Brazil will unleash a special live/DJ set incorporating material from Archipelagoes. Come find out why his live sets are so in-demand (Turntable of the Hudson, London’s Fabric, and Berlin’s Transmediale all came knocking on his door this month). Fresh from their successful Europe tour, DJ Rupture & Jahdan Blakkamoore will present their dubbed-out soundsystem set for the first time in the US. Be sure to check Rupture’s new video for his upcoming mix album, Uproot. Pirate-turned percussionista Filastine is gonna unveil material from his forthcoming album on Soot, and DJs Geko Jones & Eliel Lucero will round things out with the latest in guaracha y bass, cumbia, and dubstep. i’m guessing this show was epic, and i wish i could have been there. i did get the chance to see filastine the night prior in DC, which was fantastic. exactly what i had hoped for and expected. here’s hoping for a soot records east coast tour in the near future. fingers crossed that everything goes smoothly with the planning, i keep seeing flyers for this show and maga bo in SF or chicago and get decidedly envious. glad you all pulled things off in nyc, despite the troubles.